Having tracked Ransik and his mob to the city of Silver Hills in the year 2001, Jen and the three Time Force officers find themselves stranded when their Time Ship explodes. Nadira and the Cyclobots take advantage of their new time period by looting and terrorizing, but when the TF officers attempt to use their Chrono-Morphers to stop them, they discover that without the Red one to activate them, they're useless. 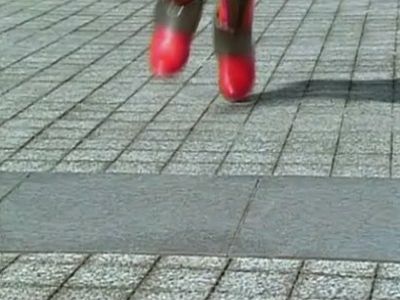 Yet, the only person who can use the Red Chrono-Morpher is Alex, who's not with them! Can a familiar, yet decidedly different, face be the salvation the team needs? The Rangers are ambushed by a mutant director named Cinecon, and sent into different "movie" dimensions: Wes & Trip in a western, Lucas in a samurai flick, Katie in a musical, Jen in a kung-fu film, and Eric in a jungle picture. 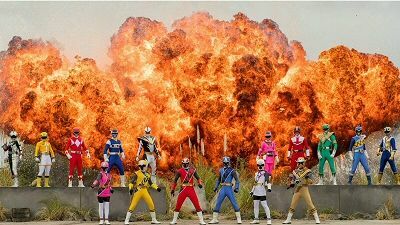 The B-Squad SPD Rangers face the evil and far more experienced A-Squad SPD Rangers. To make things even worse, Broodwing, his three Generals, and an army of Krybots swarm the Delta Base, taking over! Meanwhile, now captive of Emperor Gruumm, Doggie Cruger encounters a familiar face from his past. Pushed to their physical and emotional limits by Sgt. Silverback's intense training course, the Rangers, demoted and relieved of their Morphers, are forced to overcome their differences and faults to fully view themselves as a team. 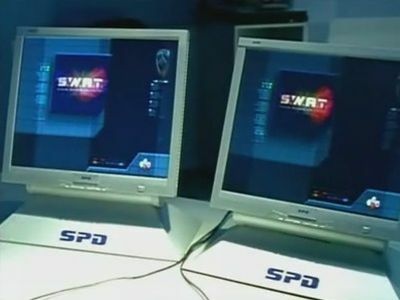 If the can pull their team back together, they'll finally wield the power of SWAT. 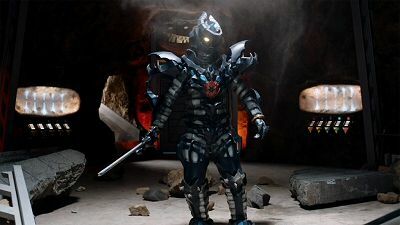 Meanwhile, Shadow and Omega Rangers find the armored foes of Stench & Thresher to be more than powerful adversaries. Also, Piggy finds his allegiances pulled in various directions. 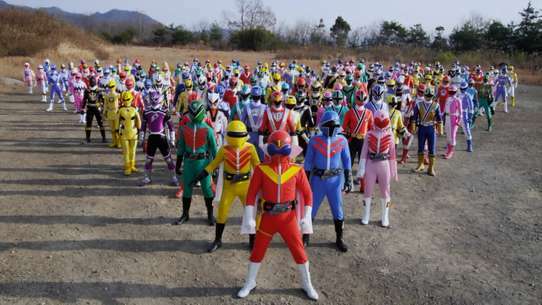 When the surviving forces of the Machine Empire gather on the moon in an effort to excavate Serpentera, veteran Ranger Tommy assembles the Red Rangers of every previous team, and the current, to assist in stopping them. The Emperor unleashes another massive attack on Earth and nearly defeats the Rangers, but against all odd they remain defiant and are rewarded with the help of all the Legendary Rangers from years past. The Rangers find themselves needing help in their toughest fight yet as they do battle with Snide one final time, and Sledge's eggs hatch across the four corners of the Earth. 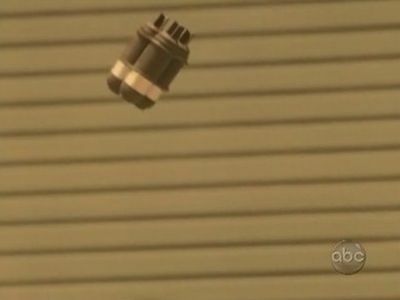 The recent Raimei incident appears to be a sign of history changing, which worries Katie most of all, since she left her family behind in the year 3000. Her concerns about their being erased by the Rangers' actions in the present distract the team, just as Frax unleashes a highly powerful mutant from a secret X-Vault, where the most dangerous criminals are kept. 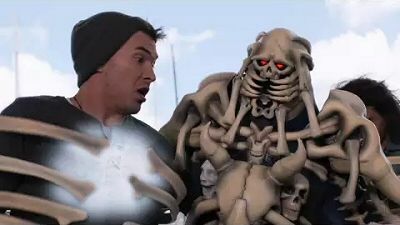 The Rangers' literally take Cinecon's script into their own hands-and escape from his torment. A new exhibit comes to the Amber Beach Museum: Worg, the robotic caveman. Arcanon sends a musician duo whose music can turn listeners into zombies. 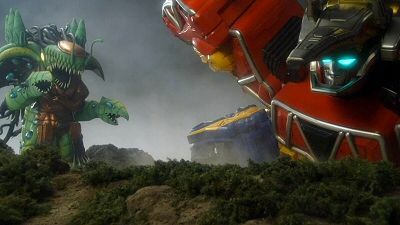 Eric's Quantum Morpher is swiped by Conwing, who uses a mouthpiece to mimic Eric's vocal pattern and take control of the Quantasaurus Rex. It takes some mysterious help from the future to do what Bio-Lab in the present can't, namely unlock some more of the Quantum Ranger's arsenal. When the four TF Officers return from the future to assist Wes, Doomtron is defeated, destroying the brainwashed Frax along with it. Ransik ignores Nadira's pleas, and takes on the Time Force Rangers personally. During his rage against them, he accidentally strikes out against his daughter, and a baby she saved. This snaps Ransik out of his vengeance-filled state of mind, and he willingly gives up to Time Force. With all the mutants now captured, Jen and the gang return to the year 3000. She and Wes reluctantly part ways, their relationship coming to a premature end. In the end, Wes agrees to his father's wishes of his becoming co-commander of the Silver Guardians (alongside Eric, of course), though for nonprofit work only. The Rangers run up against several alien criminals they've faced before, and all of whom are still captured! Sky, upset about not being given the new Battlizer Kat and Boom have developed for Jack, is sent to interrogate an imprisoned alien named Mirloc. He learns the source of the copycat criminals is a creature called Slate, able to change into others at will. But the information comes at a high cost for Sky, who has to relieve the sad fate of his father. The rangers must return to the factory and destroy the Venjix Doomsday Bot that is being built. Dillon attempts to find his sister before it's too late. Dr. K sends Gem & Gemma on a secret mission to reprogram the Doom Bot enabling it to fuse with the ranger zords and create a new megazord formation. In order to keep a promise to her parents, Summer's getting married! Learn how Summer changed from a spoiled rich snob into the independent Yellow Ranger, as her initial journey to Corinth with her long-suffering butler Andrews is revealed. Will Summer go through with the arranged wedding despite her protests? Meanwhile, Tenaya 7 plans to spoil the nuptials, by stealing the only item upholding the Landsdowns' upper-class status, to power up Camera Bot. While attempting to overcome a power problem with the rangers new zord configuration, Doctor K is haunted by memories of her childhood being held at the "Alphabet Soup" think tank and a terrible mistake for which she has tried to make up for. Still on the search for answers to Dillon's past, Dr. K figures out that Venjix has sent them on a wild goose chase. Before she can warn them they walk right into an ambush. Good thing the mysterious rangers from before show up in time to give them a helping hand. The Falcon and Tiger Ranger reveal themselves as Gem and Gemma. Koda and the Rangers battle to save an arrogant prince and the Gold Energem. Feeling betrayed and confused, the Ranger Teens have a tough time coping with the notion that Alpha & Zordon are turning someone other than Tommy into their newest teammate. 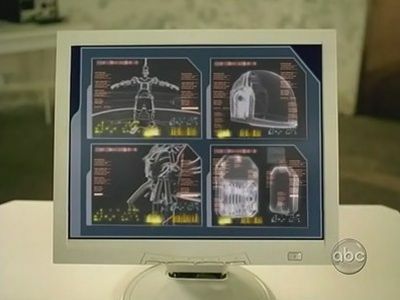 Eventually, they're summoned to the Command Center, where the White Ranger is revealed. He decends from the heavens, fully energized and morphed. Upon removing his helmet, all are pleasantly shocked to witness that it is indeed Tommy. Kim, of course, faints. Now powered by the "light of goodness", Tommy not only has powers that won't fail him, but is so strong that he's become the new team leader. 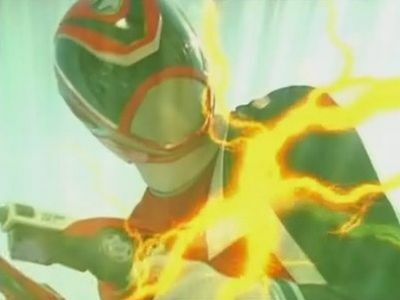 He's given an enchanted talking Saber, called Saba, which acts not only as a guide and weapon, but helps him gain access to his Zord, the White Tigerzord. 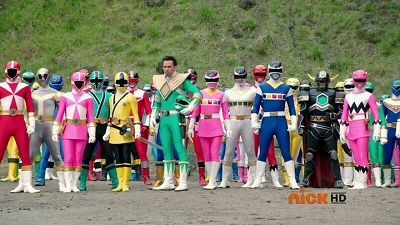 As the White Ranger & Saba take out Nimrod, AC, & DC using the White Tigerzord, the other Rangers take on Putties swarming upon Bulk & Skull's location. Though still tiny, Rita Repulsa is freed from her mini-dumpster, only to be quickly locked back in by the Rangers. Bulk & Skull, exhausted from trying to get it open, pass out before making the discover of the dumpster's contents. 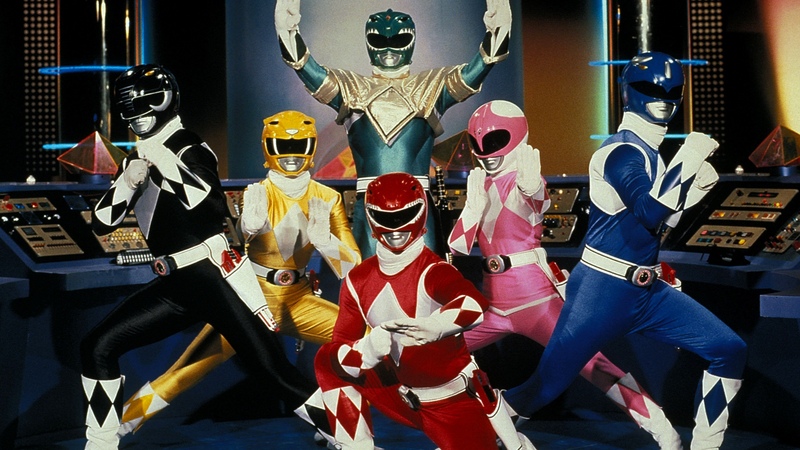 Rita is hurled back into space by Zordon, and the five Power Ranger Teens welcome back Tommy to the team, for good. 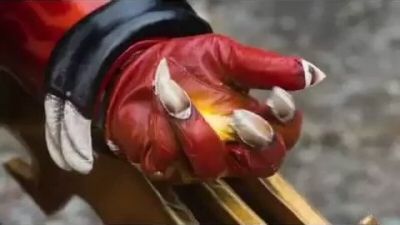 The Rangers must demonstrate their value to persuade their latest ally, the Gold Ranger, but find they do not have the willpower to do so when one of Sledge's monsters steals their courage. Zen-Aku frees Motorcycle Org, the first monster Taylor ever faced when she first became the Yellow Ranger. This keeps the Rangers busy while he kidnaps Princess Shayla, and discovers a strange sense of deja-vu about her, especially her necklace. Though he's a championship racecar driver in the year 3000, Lucas gets a speeding ticket in the present day. He's ordered to obtain a driver's license, and is stuck with a very antsy instructor, who's in for a wild ride when Lucas spots the mutant car thief Mantamobile zooming by! What secret weapon from the future can aid the Rangers in catching up to the criminal? And will Lucas ever pass his driving test?